← They can’t be LIbEralS without telling LIES! Democrats Schumer and Pelosi said they had a deal with Trump to give amnesty to their “dreamers” and not build a wall. That lie was exposed by President Trump the next day who reasserted that he has no intention of giving citizenship to any illegal invader, even if they were brought here by their parents. He also reaffirmed that the wall will be built and the border sealed against further invasion. Once again Democrats are proven to be pathological liars intent on stabbing Trump in the back any way they can. To stop the inflow of cheap labor for Republican donors and Democrat cronies who are avoiding taxes and ObamaCare for their own gain. To stop deny the Democrats from importing dependents to add to their welfare voter slaves on their parasitic plantation. To stop the invasion of America by people who hate America and want to steal from citizens, especially those who want to kill Americans. To stop the confiscation of wealth by Washington that is leaving Americans with little in the way of job opportunities by stealing prosperity. 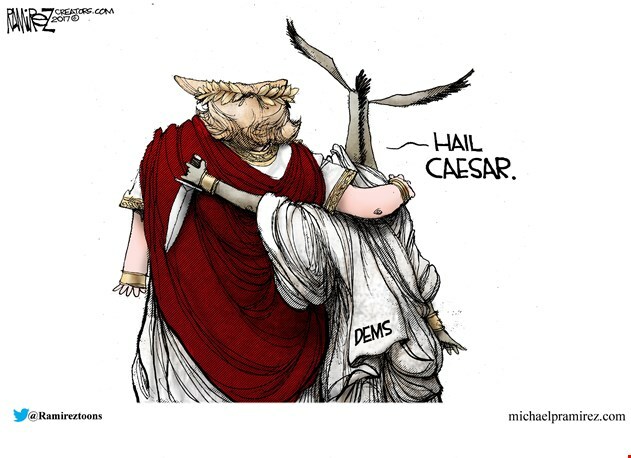 If Donald Trump ever makes a deal with Democrats to advance their agenda then his presidency will come to a gruesome one term end and America will be lost. But only the NeverTrumpers believe he would do that as no Trump supporter expects that to happen. Donald Trump has proven to be more honest and forthright than any politician in Washington with the exception of the likes of others like Sen. Ted Cruz. Democrats need to be taken out of Washington as completely as possible and most Republicans need replacing as well. The last fifty years have seen the Democrat Party become the leftist socialist party of foreign invaders while Republicans have devolved to become more centrist as the old Democrats. (Being centrist is little better than being leftist as there is nothing right on the left.) Leftists like to claim they are the centrists, but their Nazi/Communist totalitarian ideology belies the truth. That they can only propagate through propaganda and scams like global warming and Islamic peace, and that Hillary is now promoting 1984’s Big Brother as a good thing, reveals that they are the party of subjugation, not liberty. They have been angry ever since Republicans took their slaves away, and now that it looks like it may happen again they are pulling out all the stops to wage war on freedom in America using any lie they can dupe ignorant people into believing. No good can come of doing deals with Democrats. They will not agree to any agenda that Republican voters want. It’s one thing if the Art of the Deal calls for bringing Republicans to heel, but another if the Art of the Deal requires selling out. Let this be a lesson to never believe anything a liberal claims to be true until you verify it. Have faith that they are not playing the master of the art of the deal, but that Trump is playing them. This entry was posted in Politics and tagged Amnesty, DACA, Donald Trump, Dreamers, Illegal Immigrants, Invading America, Islamic jihad, Trump deals with Democrats. Bookmark the permalink.